10:00am- Field Trips to sites in Upstate SC. Trips depart at 10am from the TD Convention Center. $45 each, includes a box lunch. This is a great trip for educators wanting to learn how to make the most of educational farm visits! Visit two Upstate farms and learn how food gets from the farm to the table while gaining inspiration for your own educational farm field trips. The trip will start at Mill Village, an urban farm that trains and educates area youth through agriculture. Attendees will see their solar powered greenhouse and aquaponics system, and learn how Mill Village grows food and community on various sites throughout Greenville. Next we will drive south to a rural SC dairy farm, Happy Cow Creamery. After enjoying lunch on the farm, attendees will board a trolley to ride around the Happy Cow property and learn about their rotational grazing system and how their milk goes from grass to glass! The trip will conclude with a sample of milk and a single serve ice cream cone. Returns to TD Convention Center around 3:00pm. Local food and farm to school activities aren’t just for K-12. 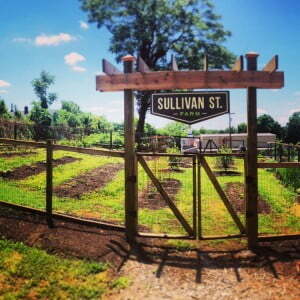 Visit two Greenville sites that are bringing local food into higher education. First, attendees will visit the culinary school at Greenville Tech where they will sample dishes made with SC Grown ingredients and learn about the school’s sustainable agriculture initiatives. 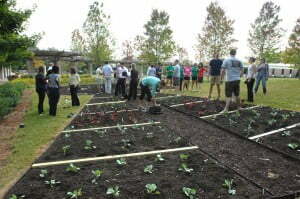 After a break for lunch, attendees will head down the road at the University of South Carolina Greenville’s Medical Roots Garden, a program that engages medical students in gardening through a unique program designed to educate physicians to change health care delivery. Returns to TD Convention Center around 2:00pm. the Swamp Rabbit Trail – SOLD OUT! 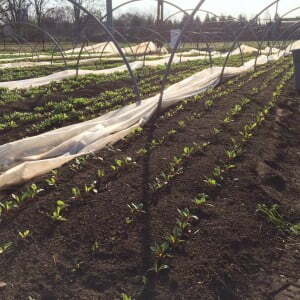 Want to learn best practices for a garden on a small site? This is the trip for you! We will start at a school garden where we will hear from a teacher and school garden coordinator about how their garden is funded, managed, and integrated into educational activities. From there we will travel a short distance to Reedy River Farm, a small urban farm that sells to area restaurants. After a picnic lunch we will learn about making the most of a small plot of land from farmer George Dubose. Returns to TD Convention Center around 2:30pm. Join us for the official conference kick-off! Meet and network with other folks from the Southeast region while enjoying hors d’oeuvres featuring SC grown products and a cash bar. A shuttle between the Crowne Plaza Hotel (the official conference hotel) and the TD Conference Center will be provided. $100 per person, includes breakfast, lunch, and resource notebook. Price will increase on August 1. Each session attendees can choose from six workshops in the following tracks: Getting Started, Farm to Early Childhood Education, Cafeteria Connections, Community Connections, School Gardens, and Messaging and Communications. View the full list of workshop titles and times. Staying in town after the conference? There are some great activities happening in Greenville including a farm to table dinner featuring Chef Vivian Howard! Tickets are available now for Farm to Fork: An all-female chef dinner at Serenity Farm. We are currently working towards obtaining continuing education authorization for the conference workshops for K-12 educators, early childhood educators, and registered dietitians in NC, SC, GA, FL, TN, KY, MS, and AL. All attendees will receive a certificate with the number of hours and workshops attended. Many states just require this certificate, but some require prior authorization. We will update this page as authorizations are obtained. Registered dietitians: This conference has been approved for all states as a continuing education activity by the Commission on Dietetic Registration. The official conference hotel is the Greenville Crowne Plaza. The Crowne Plaza will be providing SE F2S Conference attendees with an airport shuttle and a shuttle to and from the TD Convention Center for the Local Food Reception and the conference. We have a group rate and room block for the SE F2S Conference of $129 per night. Please book your hotel as soon as you make your travel plans, there are several large events happening in Greenville the same weekend as the conference and availability is already limited. You must use this link to receive the group rate. We are excited to offer a conference t-shirt this year! 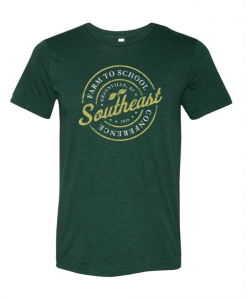 The shirt is available pre-order only and can be purchased through the registration link until August 25. Register for the field trips, reception, and full day conference here. If your organization requires pre-approval and you would like to secure your spot, you can select the “invoice” option at checkout.